The 10 Best Burgers in South Dakota! The burger has and always will be a quintessential part of American culture. The Mount Rushmore state serves up some creative culinary creations from greasy diner burgers to expensive gourmet burgers. Chow down in the 10 best burgers in South Dakota! Black Hills Burger and Bun Co. was named the best burger joint in America—and it’s no surprise! It is always the most popping place in town, and the wait is worth it. If you’re looking for some fried comfort food, this is best place in the Black Hills. Almost everything is made in house. The burgers are ground daily and the buns baked fresh. Popular menu items include “The Black Hills Blues,” with blue cheese crumbles, bacon, garlic aioli, and grilled onions; “The Fatty Smitty,” with cheddar cheese, bacon, fried egg, lettuce, tomato, and garlic aioli; or “The Texan,” with pepper jack cheese, grilled onions, jalapenos, bacon, and chipotle barbecue sauce. They have something for everyone, with two vegetarian burgers, “The Lousy Hunter” and “The Loaded Hunter.” Unique weekly burgers are offered. Trust me—you’ll want to try them all! Sugar Shack is an inconspicuous little joint hidden away in the Black Hills. This hole-in-the-wall certainly doesn’t look like much, but it packs a punch! The portions are huge and everything is fresh. The half-pound burgers are to die for. 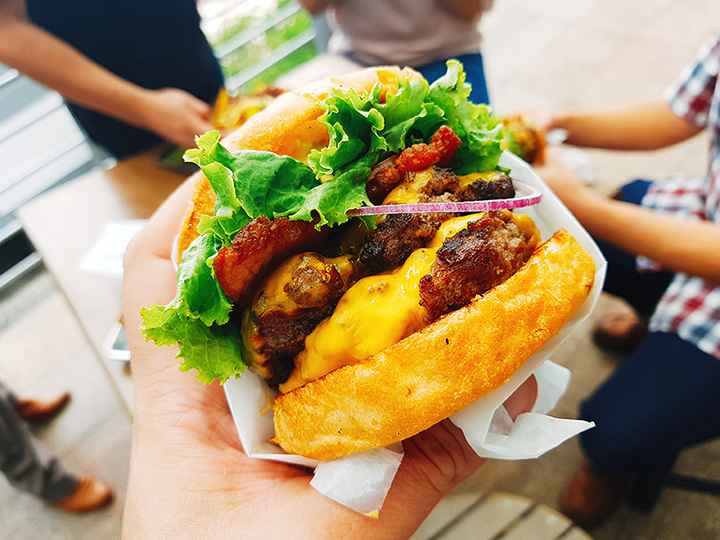 Burger options are the sugar burger, Swiss mushroom sugar burger, Chili Cheese Burger, hamburger, double hamburger, cheeseburger, double cheeseburger, bacon cheeseburger, and double bacon cheeseburger. The local favorite is resoundingly the Bubba Burger. Yum! This little shop was founded in 1929 during South Dakota State University’s “Hobo Day” and has been a cornerstone of the Brookings community ever since. Burger varieties are limited to hamburger, double hamburger, cheeseburger, and double cheeseburger, but all options are delicious! Various toppings and condiments are available. Breakfast burgers are available in the morning. Shakes are also served in flavors of vanilla, chocolate, strawberry, pineapple, cherry, and caramel. Hit up the favor burger spot of South Dakota State students and enjoy the best burger in Brookings! This North Dakota-based restaurant has expanded to South Dakota, bringing with them their award-winning burgers. Sickies Garage offers a variety of interesting burger creations, craft beers, and other American cuisine! Each location offers a huge variety of burgers. This is a very vegetarian-friendly burger joint, as any burger patty can be substituted for a veggie patty. The quint, retro storefront will send you back in time when poodle skirts were all the rage, the Beatles set the bar for rebellion, and burgers weren’t limited to fast food. Menu items include 10 varieties of burgers, sides like cheese curds and corndogs, and dessert. The most popular burgers are the bigger burger, bacon cheeseburger, double burger, and chipotle ranch cheeseburger. Sit on the deck and enjoy the flowers, cheer on your sports team, or converse with the locals while dining on a top-notch burger! All burgers are a half pound of meat and served open-faced with lettuce, tomato, onion, and pickles. Varieties are hamburger, cheeseburger, mushroom & Swiss burger, and bacon cheeseburger. Extra toppings include bacon, grilled onions, jalapenos, and mushrooms. With mouth-watering burgers, crispy fries, and a welcoming atmosphere, you’ll become a regular! This family-owned business is in the tiny town of Faulkton. The Burger Shack uses fresh South Dakota beef and makes patties by hand daily. Twenty-one varieties of burgers are on the menu including the barbecue bacon cheeseburger, coleslaw burger, Hawaiian burger, chili burger, and many more. Three varieties of sliders are available. Seasoned fries, krinkle-kut fries, and sweet potato fries are all offered. This upscale hangout serves unique takes on the classic dish. From gravy to gouda, nothing is off the table for these burgers! Popular menu items include the Pull Monty Burger with barbecue, smoked gouda, bacon, pulled pork, and onion frizzles, Black N Bleu Burger with Cajun seasoning and buttermilk bleu cheese crumbles, and the Country Boy Burger with fried egg, bacon, mashed potato, onion frizzles, cheddar cheese, and country gravy. This 21 and over pub serves amazing burgers and delightful tap beers in a typical bar atmosphere. Twenty-four different types of craft beers and 40 handcrafted bourbon varieties are available, perfectly complimenting a savory burger. Dress up a classic burger with your choice of toppings such as bacon, egg, jalapeno, avocado, and more. Or go with any of the eight available gourmet burgers. You won’t want to pass up this perfect pub! Dakotah Steakhouse serves high-end burgers to impress even the classiest gourmand. It is prepared with a full half pound of ground beef and served on a Tuscan bun. All beef is aged on site for a minimum of 30 days. Five regular burgers are offered including Once in a Bleu Moon Burger, Philly Burger, The Rodeo, and the Classic Cheeseburger. A burger of the week is also available. Want wine with your burger? This steakhouse suggests a cabernet, merlot, chardonnay, or white zinfandel. Make sure not to get ketchup on your suit!